Tapping into high-speed optical networks, facilities offering multiple services are springing up across the globe. Companies are finding that providing such end-user services is a profitable and fast-growing industry. As Internet users delve ever deeper into the virtual world of cyberspace, the optical network behind it is having an impact on the physical world, an impact that is driving the growth of the colocation market. "In general terms, colocate is just space," says Brent Bomer, manager of access services for Williams Communications (Tulsa, OK). "It's putting a rack of equipment in someone else's space." As Internet use booms, companies that need servers and communications equipment to allow users to link into their web presence are increasingly turning to other companies to provide them the space for that equipment. The customers for colocation can be anything from internet service providers (ISPs) to financial institutions that need their own data centers (see figure). 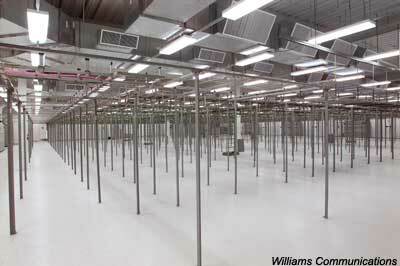 In Salt Lake City, UT, a William Communications colocation facility awaits the banks of computers and network bays that will enable it to provide a variety of services to customers. In its simplest, space-renting incarnation, colocation produced $318 million in revenues in the United States last year, according to market research firm Forrester Research (Cambridge, MA). This year, Forrester projects, revenues will grow to $466 million, rising to approximately $1 billion by 2004, a compound annual growth rate of 22%. But Forrester defines colocation as only one piece under the umbrella of web hosting. At its lowest level, hosting can mean renting out space on a disc drive to a simple web site. Such shared hosting will be worth $439 million this year and $891 million in 2004, Forrester projects. Managed hosting, which includes equipment maintenance and other engineering services, will earn $983 million this year and grow to almost $11 billion in 2004. Custom hosting, which adds database and web services to the package, will rise from $577 million this year to $6.88 billion in 2004. The Philips Group (London), a consultacy that hosted the first colocation summit in London last month, projects that the European colocation market will be worth $5.4 billion next year. In a sign that the market is becoming more significant, 11 companies have gotten together to form the Colocation and Hosting Association (CHA), which held its first meeting in London in early June. "Collectively, perhaps, we'll have more of a chance to educate people," said Sharon Corrigan, vice president of the association and director of marketing for Worldport Communications (Dublin, Ireland), one of the founding companies. "We're the backbone of the Internet, us and the fiber companies," she said. Other founding companies include Cascade, Digiplex, GlobalSwitch, Iaxis, IP Powerhouse, IXEurope, Level 3 Communications, PSInet, and Teleglobe. The appeal of colocation is basically economic, said Tim Guarnieri, vice president of Paix, which provides open access to the ISP market. Like AboveNet, a data center provider that was one of the founders of the CHA, Paix is owned by Metromedia Fiber (McLean, VA). The cost of building a facility to house Internet equipment and finding qualified staff to run it make handling their own web services unappealing to companies, Guarnieri said, particularly those whose primary business is not based on the Internet, such as a financial services company. "When they go to the Internet they have to have this equipment, and the question is ‘are we going to do this ourselves or are we going to outsource?'" said David DuPree, director of asset management at Cathartes Investments (Boston, MA), a real estate development company that recently broke ground for a 385,000-sq ft colocation center outside of Boston, and which has similar properties in Chicago, Hartford, and six other cities. It can take a year or more to build such a building, and with companies wanting to get onto the Internet much faster than that, having one at hand with space to rent is appealing. DuPree said his company addresses the special concerns of colocation, such as heightened security, fire suppression, floor loads, and power needs that far exceed those of a conventional office building. A colocation facility, which draws 80 to 100 W per square foot, as opposed to 10 W per square foot in a high-end office building, needs its own backup generators, for instance. Amsterdam, The Netherlands, has already put a cap on providing power to new entrants, Corrigan said. Another consideration, adds Williams' Bomer, is to put the equipment as close to the end user as possible. It's too costly and inefficient to be sending content across the long-haul networks. Williams is getting around the worry of local networks acting as a bandwidth bottleneck by building their own local networks in 50 cities in the US, selling bandwidth at the OC-48 level. And with that investment the company is growing away from the simple space-for-rent model. "We're changing the way we look at colocation here at Williams – I think a lot of people are in the industry – to where we're adding value-added services like maintenance," Bomer said. The CHA expects to grow along with the market, Corrigan said. After announcing its existence a couple of weeks ago, it has been receiving inquiries from companies beyond the original group. As in other areas of Internet growth, Guarnieri expects that colocation will experience the leapfrog effect. Demand will lead to the creation of more facilities, which will in turn give businesses access to greater bandwidth. As the bandwidth becomes available, newer applications, such as those with more graphical content, will be used more and more, driving demand even higher. "I can see the growth continuing on for a good period of time," he said. "I don't see the trends in the marketplace cooling off anytime soon."